Successfully Added Motorcycle GPS Navigation System - IPX7 Waterproof, Windows CE 6.0, 4.3 Inch Display, 8GB Memory, 1900mAh, Highly Accurate to your Shopping Cart. 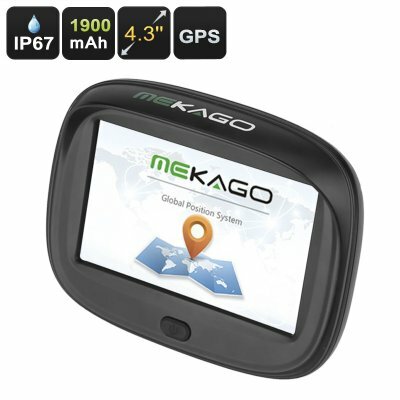 Head out on your upcoming motorcycle road trip with confidence and never get lost again with this spectacular motorcycle GPS system. Holding a 4.3 inch screen that displays all the navigation tools needed in a 16:9 aspect at 480x272 resolutions, you can be assured that this GPS always displays the most up to date traffic data and fastest routes to your destination in a clearly visible manner. Step on your bike and enjoy the trip and scenery to the absolute most. With this motorbike GPS navigator you no longer have to worry about reaching your destination on time. With its IPX7 waterproof rating you can be assured that this GPS can not be stopped by any bad weather conditions. Whether it is fog, rain, or snow, with this navigation system you can continue your journey without the need to worry about the wellbeing of your electronic GPS. Additionally, the device has been equipped with a little rain shield at the top, ensuring that no rain drips will gather at its screen and obstruct your clear view of its navigation tools and maps. A built-in 1900mAh battery provides you with enough power to use this motorcycle navigation system for up to three hours, making this the perfect GPS tool to accompany you during all your long rides. Featuring a built-in and highly sensitive antenna this GPS navigation system is capable of providing extremely accurate information and advice based upon the latest local traffic status. Additionally, this navigation system features Bluetooth, allowing you to sync the device with any pair of Bluetooth headsets out there so that you will be able to receive the GPS voice commands directly into your ear. Its Windows CE 6.0 operating system provides you with a smooth user experience and lets you easily download and install your own maps. Whether you go out for a short trip through the local neighborhood or are about to enjoy an international road trip, simply download the needed maps and you’ll be all set to embark upon your next adventure without the fear of ever taking a wrong turn again. With 8GB of internal storage available, there will be enough space for you to save all the needed maps and applications that will help you to fully enjoy your upcoming trips. This motorcycle GPS comes with a 12 months warranty, brought to you by the leader in electronic devices as well as wholesale electronic gadgets..